We were in a major rush and while I was putting Brecken in the car, he seemed mildly distressed and was mumbling like he was trying to tell me something. I kept saying, "I'm sorry, I don't know what you want!" When we got home about an hour later I kept hearing a strange chirping sound. Eventually I realized he had a zhou zhou pet (a toy hamster) stuck in the leg of his pajamas. I was making dinner and enjoying how quiet my house was. Then I remembered my house should not be quiet, ever. Turns out it was silent because it takes a lot of concentration for a 1 and 3 year old to remove 400 baby wipes from their packaging. Last Sunday while I was sitting in church I majorly fumbled a cup of hot coffee and spilled it all over myself, my chair, and the floor in front of me. I was pretty impressed with how many people around me were able to pretend like they didn't see a thing. Not even a snicker. I sure don't have that kind of self control. Greyson got four of eight cavities filled this week, plus a crown. It was his first experience with novacaine, and when I asked him to smile for this picture, he got a very far away look in his eyes like he was trying to remember how to work his face. Haydn has been experimenting with fashion choices lately, and for a while was wearing his baseball hat backwards. When we went to the gym, the lady behind the front desk said hello to him. Instead of just saying hello in return, he self-consciously touched his hat and said "Don't worry, I'm not a gangster." I'm sure she was relieved. Speaking of the gym, mine now offers "family zumba." This is ideal for moms like me whose kids do not have school on Friday. However, my sons are not so thrilled with the Family Zumba. If you don't know what Zumba is, imagine if jazzercise and clubbing had a baby. That's Zumba. It's probably not something any son ever wants to see his mother doing, let alone be forced to participate in. I make them go anyways. My 9-year-old son is starting Little League next week. This will be our family's first venture into sports, with the exception of a brief soccer stint when he was four which resulted in him standing in the middle of the field and crying while the rest of the kids ran past him... over and over again. For whatever reason, he hasn't wanted to play sports again until now. I just found out I have to by him a cup. Is this the boy equivalent of going shopping for your first bra? I was not prepared for this. I didn't even buy my own bras until I moved out of the house because I was too embarrassed. I would just sort of walk past the department and point at one from a distance and then go wait somewhere else while my mother bought it. I think this will be a good opportunity for daddy-son bonding. They can purchase a shield for his man parts together. Speaking of man parts, my toddler just discovered his and thinks it is VERY funny to point at them and say "stinky" then laugh hysterically. He also toots and says "Oh, bless you!" which I guess is more polite than some of the things I've heard. Okay, your turn! For your 'fessing convenience, I'm trying out this very fancy LINKY tool. Hopefully it will make it easy for everyone to come and visit your blog and read your 'fess ups ~ you know you have them! Write your own post of confessions. Remember, we are just laughing at life and keeping it real. No big deal. Come back here and link up! Easy peasy lemon squeezie. P.S. By the time I got this post finished, my son had done his "special" shopping with his dad and wasn't embarrassed in the least. He came home and said, "Hey Mom, wanna see my nut guard?" This new phase is freaking me out. oh, i love reading about your life - never a dull moment. i had a similar 'wipe' moment round our parts recently, only it was the resident 2 yr old un rolling an entire toilet paper roll...thankfully i, too, noticed the unusual quiet during the episode and caught up with him just as he was beginning the transfer to the toilet! that dental phtoto - hysterical! we're beginning T ball with our 5 yr old in 2 weeks. we had our first sporting experience this winter with a 2 week b-ball camp. he LOVED it, so hope T ball goes well too. hubby has been asked to coach...he's still thinking about it - move over tommy lasorda! oh, and I HEART Zumba! can't immagine doing it in front of kids - your description is spot on! That post is adorable. At least you have blogging to remember these memories. My kids are 14 and 18 and I have a journal with silly things they have done and said - you will cherish it. I remember when my daughter played Little League once, she wanted to shop for a "cup" also - just like her big brother - At 5 it was hard explaining why she didn't need it - :) Enjoy your adorable kids - blink and they grow up too fast. Have a wonderful weekend. Your family is too funny!!! I absolutely love how real you are!! I got to experience the whole cup thing for the first time this year too. I didn't do to bad for a girl who was always too embarassed to buy toilet paper until I was livin' on my own and absolutely had to. Haha. Oh, an that whole "Bless you" thing - PRICELESS!!! Knowing your children, these posts just makes me fall more and more in love with them!! "Then I remembered my house should not be quiet, ever." Truer words have never been spoken. I had to shop for cups for the first time last year. That was definitely weird. My sons think they're hilarious, though, and have been known to try and hit each other while they're being worn. Boys. Thank you for sharing! I look forward to Fridays even more now that I've gotten connected with everyone who's fessing up. So much fun!!! This post was stinkin' hilarious! I just discovered you through Wonder Woman Wannabe, and I'm dying laughing. I'm a mom of 2 boys . . . and I wish we had a family zumba class nearby. Hilarious! I should have read this earlier this morning because I would have been warned about the baby wipe mess that occurred in our playroom. Wipes everywhere. That's what happens when I attempt to get things done around here and leave my boys unsupervised for .5 seconds! you are seriously, the funniest writer! 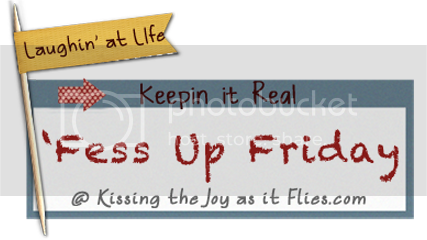 i love love love your fess up fridays! Hilarious! I loved this post so much. You crack me up!